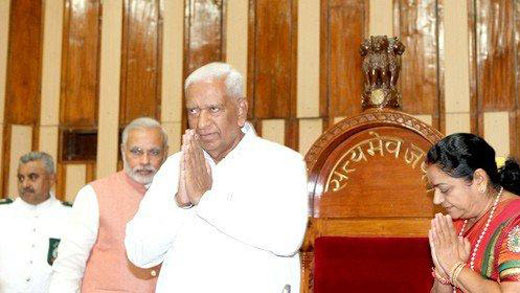 New Delhi, May 15, 2018 : Even as the Congress party attempts to keep the Bharatiya Janata Party (BJP) from forming the government by throwing in support for the JD(S), the role of Governor Vajubhai Vala has now gained significance. As the JD(S)-Congress combine stake claim to form the government, BJP sources say that they will do all that they can to form the government themselves, and Vala’s role will be crucial for that. On realising that they will not be able to form the government with just 78 seats and that the BJP will emerge as the single largest party with 104, the Congress put their weight behind the JD(S). In a day of fast paced political developments, the Congress accepted HD Kumaraswamy as the chief minister. Following this, around 4 pm, HD Kumaraswamy wrote a letter to the Governor staking claim to the government. However, his party leaders were not allowed inside the Governor’s residence, sparking speculation on what the Governor plans to do (Update: JD(S) and Congress leaders have now met the Governor to stake claim to form the government). Meanwhile, the BJP delegation met the Governor and asked that they be allowed to prove their majority on the floor. The Congress and the JD(S) have sufficient grounds to be suspicious of the Governor’s role now, not just because of how the BJP is believed to have ‘used’ the governor’s post in Goa and Manipur to grab power, but also Vajubhai Vala’s past as a staunch Modi supporter in the Gujarat BJP. From the town of Rajkot in Gujarat, Vala was a BJP member who started his political career with the RSS, and joined the Jana Sangh in 1971. Vala served as the Speaker of the Gujarat Legislative Assembly from 2012 to 2014. There are no set rules on what the Governor should do now, it is well within his choice to ask anyone to prove their majority on the floor of the house. Vala could either allow Kumaraswamy to form the government or ask the BJP to attempt it first since they have the most seats in the Assembly now. He could also not decide for a while – just like Governor Vidyasagar Rao did in Tamil Nadu recently – giving the BJP the time to cobble together a majority. "Generally, in such situations, the Governor invites the leader of the largest party with the condition that they must prove their majority within a certain period of time, generally a week. If within that time, the Opposition parties move a no-confidence motion and it gets carried, then the government will be defeated and President’s rule will be in place for some time. It is a very peculiar situation," former Attorney General Soli Sorabjee told TNM. “One principle is that the leader of the largest party should be invited first, but there are also cases where the leaders of pre-poll and post-poll alliances were invited. There are precedents of all kinds. Governors have used their discretion in different ways,” he added.“The Constitution also says that the Governor’s discretion can’t be questioned even in a court of law,” Subhash Kashyap said. “In the Karnataka situation, I think the Governor will appoint the leader of the single largest party. The other alternative, academically speaking, is that the Governor should keep himself away from partisan politics and controversy and invoke Article 175(2) of the Constitution and tell the House that it is not clear to him as to who commands majority support and declare it a hung Assembly. Whomsoever the House then elects, will be appointed by the Governor,” Subhash Kashyap added. What the JD(S) and Congress suspect Vala will do is give the BJP time to reach the half-way mark, by giving them the time they need. But with the BJP not having their numbers within the party, they will have to look to chipping MLAs away from the JD(S) or the Congress.